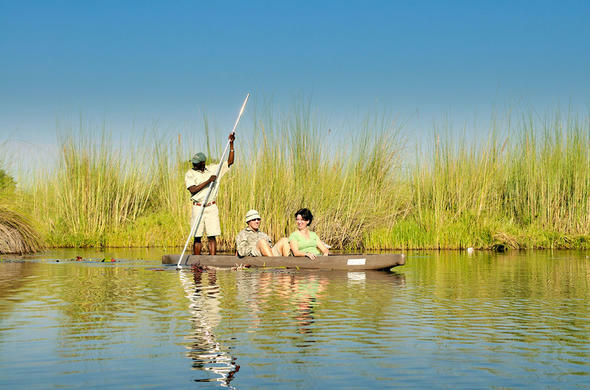 A leisurely moko safari in the Okavango Delta. 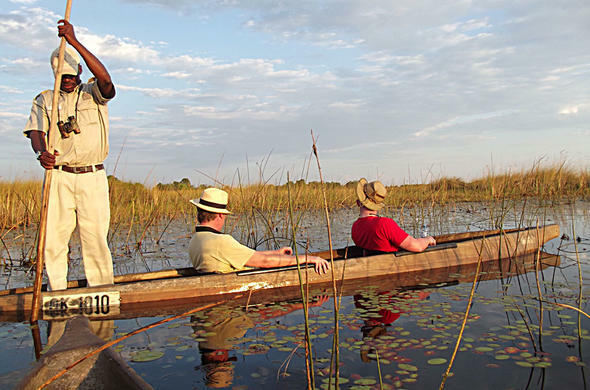 There are many forms of safari activity in Africa but few can match the unique Makoro (also spelt mokoro) or dugout canoe excursions in the Okavango Delta where silence is one of the highlights. When the first explorers and adventurers found their way to the Okavango they were ferried through the waterways by makoro, carrying all their belongings in these seemingly unsteady craft. What they found out was that the dugout canoes were the only way of getting around the Delta, and today the tradition has been westernised into a memorable safari activity in a spectacular wilderness. With the steep growth in tourism in Botswana the need for Mokoros increased alarmingly and concern was raised about the effects of this on the fragile environment of the Okavango. With a relatively short lifespan the traditional Mokoros had to be replaced every few years leading to fears of devastation. Trees suitable for the making of the Mokoros are often more than 100 years old, with three species been used, the African ebony Diospyros mespelliformes, sausage tree Kigelia africana, and the knobthorn Acacia. Alternatives were sought and finally it was decided to manufacture fibreglass replicas as replacements. Not only did they last longer but they were environmentally friendly. So popular are these replicas that they are even bought by the locals who vow that they are more stable than the traditional craft. Today very few trees are cut down for the sake of making Mokoros. 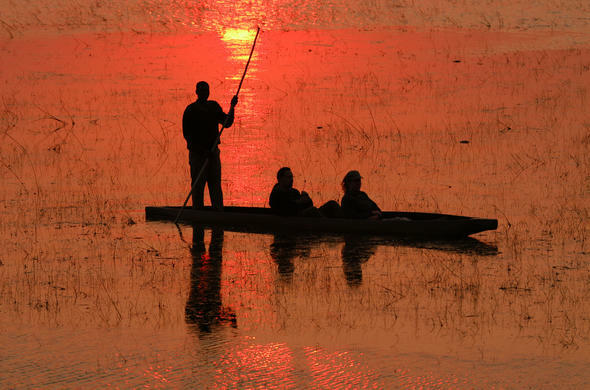 The Mokoro is used widely in the Okavango Delta, for tourism and general day to day life, and as such incidents with hippo do occur, but they are very few in relation to the number of Mokoros on the delta waterways. The guides who pole the Mokoro are experienced in the ways of the delta and the habits of hippo, and do all they can to avoid confrontation. Incidents that have occurred are very often due to wounded hippo or human carelessness. 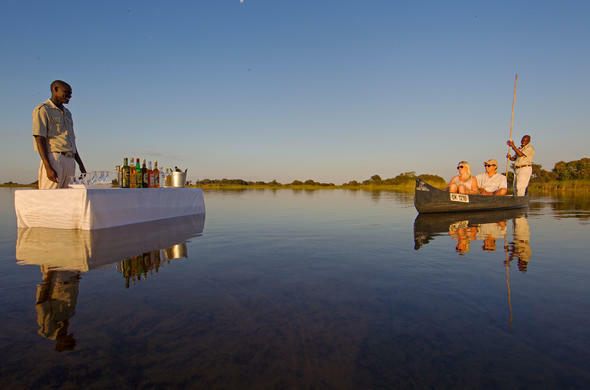 Gliding silently over the water, with the sounds and scents of the Okavango accompanying you is truly one of the best nature experiences to be had. The guides on the Mokoros have grown up in the delta and have an intimate knowledge of its workings, adding to the experience, an experience that will live long in the memory. Jao Luxury Tented Camp is located on an island within a private reserve (with night drives included in activities) on the border of the Big Five Moremi Game Reserve. 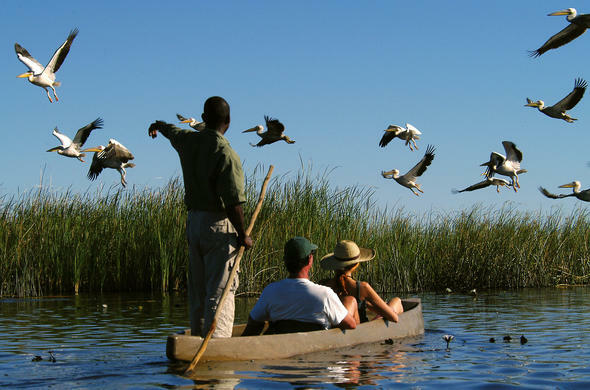 Camp Okavango is set on a remote island surrounded by permanent waters which is great for year round activities including birding and fishing. Xugana Island Lodge overlooks the stunning Xugana Lagoon, a permanent water source in a private concession. Stanleys Camp is set on Chief's Island, where you can walk with Elephants and even see Wild Dog amongst loads of other game.